This lavishly illustrated, 260-page magazine provides an essential mix of critical, incisive and entertaining architecture, design and art coverage, with regular pieces on sustainable construction and interiors, retail, museums and residential, lighting, furniture and flooring. Blueprint offers strong opinions and critical thinking, news, feature writing and beautiful photography, directed at professionals at all stages in their career. 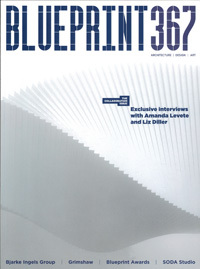 Launched in 1983 by such major figures as Terence Conran, Marcello Minale and Richard Rogers, Blueprint was the first magazine to cross the boundaries between design and architecture. Today, it is still revered by architects and designers around the world for its fresh and unconventional approach. If you’re studying on an accredited design/architecture course or just starting out in your creative career, subscribe today... Udgives på engelsk - hver anden måned. Levering af første blad: 6-10 uger. For more than 20 years FX has been the essential magazine for the contract interior design industry, featuring exciting new projects from around the world, as well as in-depth analysis of the issues that matter to designers, specifiers and end users.